The use of social media to inform communities about emergencies has taken local public information officers by storm. Recent events have outlined social media’s popularity as survivors of Haiti’s earthquake turned to Twitter and other networks to update their statuses and verify the well-being of loved ones. Its popularity with citizens worldwide has led to a bevy of questions regarding use and best practices. 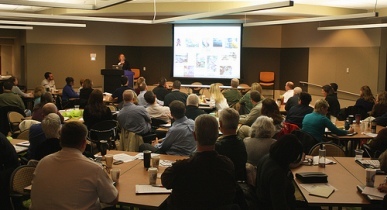 About 130 public and private information officers from the emergency management, first response and business continuity communities gathered on Jan. 21 at the Midwest Disasters 2.0: Social Media and Emergency Response training session. The session’s goal was to assemble Kansas City, Kan.-area emergency communicators to learn how social media systems work and how they can be used during a disaster. Photo: The Midwest Disasters 2.0: Social Media and Emergency Response training session brought together public and private information officers from the realms of emergency management, first response and business continuity. Photos courtesy of the Mid-America Regional Council. Two things were made clear during the workshop, said Crowe, who also was chair of the workshop planning committee. First, social media isn’t going away, and emergency officials and public information officers need to figure out ways to use it. And second, there’s no wrong way to get involved with social media. “It’s more or less a go ahead and jump in, and see where you go and run with it,” he said. Social media best practices have been the topic of discussion nationwide. Best practices are hard to come by, Crowe said, because everyone has developed their own methods for use of the different social media networks. However, at the Midwest Disasters 2.0 session two examples were given that illustrated productive use of the networks. The local National Weather Service official uses Skype — a software application that allows users to make calls over the Internet, including video conferencing — to talk to the local media during a weather event. And one of the volunteer Medical Reserve Corps chapters uses Facebook to improve recruitment in the region. “There were a lot of examples depending on the system that was used as to how it can be best utilized by other people,” he said. Crowe’s office uses Twitter as a free short message text notification system. It also uses Facebook, YouTube and iTunes. He is responsible for keeping the networks up-to-date, and the county’s social media use began in 2008 with a blog. The session’s Web site includes video tutorials of how to use various networks, including Twitter, YouTube and MySpace. Crowe said the videos were found on YouTube by a planning committee member. The session, it is hoped, will be repeated annually, he said, or at least until social media is no longer a pressing issue, which he doesn’t think will be in the foreseeable future. In December 2009, Government Technology reported that North Carolina issued social media policy and an online tutorial to state agencies and departments. The guidelines will help and encourage state agencies to develop a presence on social networking sites and provide guidance to ensure social media use complies with public records and archiving laws. This entry was posted in Commentary, News and tagged Add new tag, Emergency management, Medical Reserve Corps, Social network, Social network service. Bookmark the permalink.